Pima County public libraries are allowing those with over due book fines to pay with canned foods. TUCSON, Ariz. - Donating some food can help you save money at the library. The Pima County public library is hosting "Food for Fines." Starting today you can donate one non-perishable food item to get one dollar taken off any overdue library fees. This goes until the end of the month. All donations will go to the Community Food Bank of Southern Arizona. Those who don't have overdue fines can still participate. 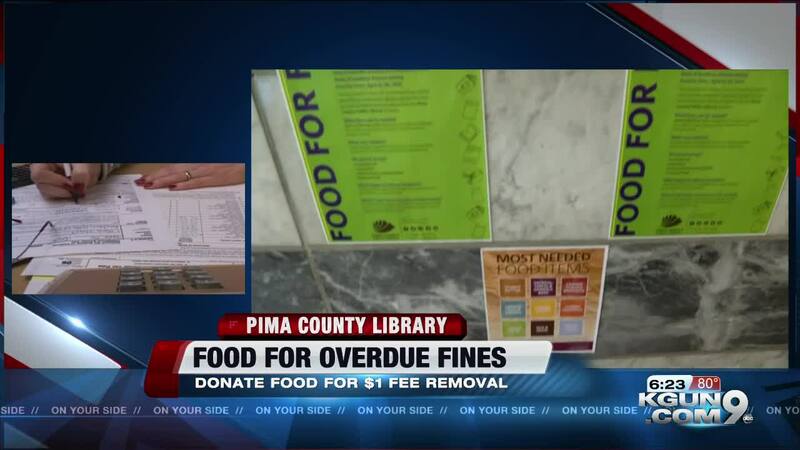 For more information about "Food for Fines" visit the Pima Coutny public library website .